The Herbalist is a small shop in the market town of Ulverston in Cumbria specialising in herbal remedies, food state vitamins and minerals, and organic and biodynamic skincare. 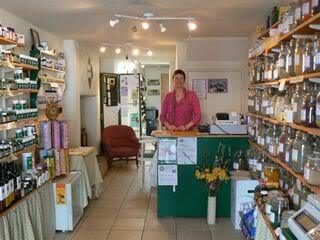 The shop and practice is the result of over twenty years experience in the Health Food trade. Trained as a Clinical Aromatherapist and Medical Herbalist, Sandra O’Neill has a broad approach to natural health having studied naturopathy and nutrition. The Herbalist offers complementary therapies including Herbal Medicine, Aromatherapy, Sports and Remedial Massage, Homeopathy and Reiki. Appointments are available 6 days a week including some evening appointments. The shop sells a wide range of organic products including Biodynamic Herbal Tinctures made locally by Lakeland Herbs, an extensive range of our own label herbal tinctures plus Biohealth Herbal Capsules. Dried herbs are also available and there is a range of Herbalist tea blends. Essential Care, Woadworks and Weleda provide our skincare products and we get organic Essential Oils from Quinessence. We also stock natural wax candles with essential oils and beautiful beeswax candles made in Yorkshire. It is important to us to support local businesses so we source as much as we can locally, then choose British companies over foreign ones. Our incense from India, made with natural oils and resins, is fairly traded. Our supplier has visited the factory to make sure the working conditions are as they say. HERBAL MEDICINE is an ancient tradition of healing using the power of plants to encourage health in the body. It is as applicable today as it was many years ago. Since the introduction of the National Health Service 60 years ago, we have lost touch with our traditional practises and the knowledge of healing herbs is not as widely spread as it once was. Many chemical medicines are copies of natural plant constituents, aspirin being one, digitalis another. The problem with the copies is that they do not contain all the elements provided by nature, therefore, side effects occur as the product is unbalanced. Balance is the key in natural healing. When you consult a medical herbalist you will be asked many questions to ascertain where the imbalance is in your system. You are not a separate body of systems, you are a whole being, and need to be treated as such to regain balance and health. Disease is a word we use all the time, if we break it down to dis – ease, we can see more easily that it means a lack of ease, a lack of balance. By looking to the natural world we can find medicinal plants to aid the return to a whole, physically and emotionally, balanced state of health. Good health is not just an absence of symptoms, but a state of vitality and zest for life that is all too often missing in our lives. Plant medicines can be administered in many ways, as tinctures, teas, capsules, flower remedies and essential oils, suppositories, compresses, ointments and creams. Something for everyone! From cosmetic use to the healing of serious imbalance, herbal medicine is the choice for people desiring a more natural approach to health. 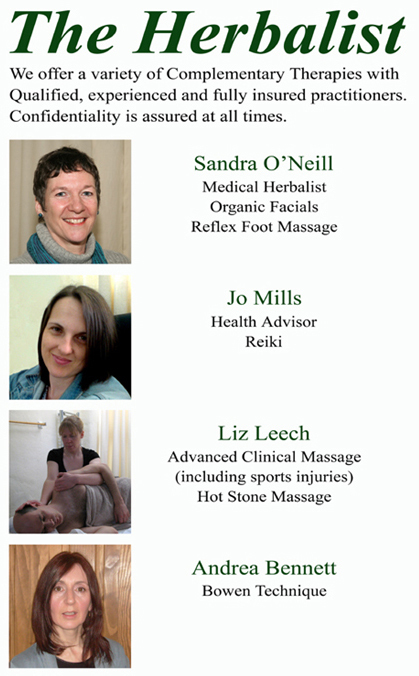 The Herbalist also offers a range of Complimentary Therapies with qualified, experienced and fully insured practitioners. Our products are of the highest quality that we could obtain, this often makes them more expensive in the first instance but cheaper in the long term. Better quality products being more effective in their action. Less of them are needed and have a longer lasting result. For a stock list please download the PDF below which will be available soon. where an anti-oxidant could prove useful. Free Mini Facials and product samples. Booking recommended for facials. Cruelty and Chemical free Skincare range, full of natural goodness, come and try. Arthritis, Gout etc. Trials have shown that it can also help with insomnia. It is one of the nicest remedies I have tasted, so come along and try for yourself. Why not pop into the herbalist for a well earned pamper? Escape the hustle and bustle of the busy streets and let Liz massage away the stress and ache in your shoulders from the xmas shopping. All massage will take place through your clothes, Liz may insist you remove your coat! 15 minute treatment for £12 or 35 minutes for £25. Massage Gift Vouchers are also available for that special Xmas pressie. Treat someone else to a relaxing treatment with hot stones. All vouchers are valid until June next year and the cost is £35 for an hours treatment or £20 for half an hour. Other offers for Winter Immunity to be announced! Contrary to newspaper reports, you can still access your favourite herbal remedies from a qualified Herbal Practitioner. Call in to The Herbalist and we can supply you with the best quality remedies available. Free advice is given on all products and we have some free samples for you to take away to try. Our staff are friendly, knowledgeable and always willing to help. Free herbal tea tasting on a daily basis, come and try something different….you may be pleasantly surprised. July Offers include chemical free sunscreens and Aloe Vera Gel for when you’ve overdone it!